Sunderland and Newcastle United are arguably facing the biggest derby day since the 1990 play-off semi-finals, with Sunday’s St James’s Park showdown pitting two of the three sides realistically battling to avoid joining Aston Villa in the Championship. 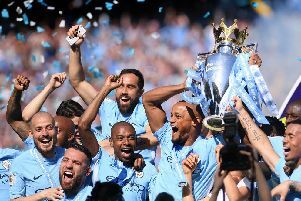 With Premier League clubs banking an estimated £100m from next season’s new television deal, relegation would be a seismic blow for either of the two clubs, with the outcome of Sunday’s encounter potentially proving to be decisive. But while the nerves of supporters might be frayed over such a crucial encounter, midfielder Larsson – who has featured in all six of Sunderland’s record-breaking run of consecutive derby wins – is licking his lips at the prospect of Sunday’s tussle. Larsson told the Echo: “Of course there’s more pressure on the game with both clubs involved in the relegation fight. “But you always look forward to this game. “Yes, the pressure’s on because of the situation in the league, but it’s one of those games that you want to be involved in as a player. “You want to walk away from St James’s Park with three points again, which would set us up nicely for the run-in. “It’s a massive game, but they’re always massive. “I’ve been involved in enough of them now to realise how important they are for the whole area. “But three points for either team at this stage of the season is obviously massive. We all know that. “If we can get them in the local derby as well, it would obviously put us in a good situation. Sunderland head into the derby on the back of an upturn in performances over the last half-dozen games, even though Sam Allardyce’s men have only managed to add six points to their total during that run. But Larsson – likely to be on the bench at St James’s – believes Sunderland have to keep faith that the rewards will ultimately come if they maintain current standards. The Swedish international added: “It doesn’t always mean much if you’re playing well. Turning that into points is the major thing. “But there is a belief there that we’re improving, that we’re difficult to beat again.